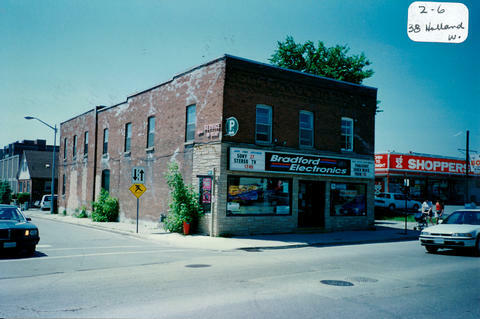 The structure located at 38 Holland St. West (on the southwest corner of Holland and Drury Streets) was built around 1900 in the Ontario Vernacular style. B.B. “Ben” Collings lived upstairs with his wife (a Waldruff), and children Bernice, Kathleen and Norman. Both daughters became school teachers and Norman (“Dodger”) was a professional hockey player who helped his father and later took over the business. Ben’s workshop was also located here and there was a horse stable at the rear of the property many years ago. The back end of the building was destroyed by fire in the 1920’s. Ben Collings was involved in several businesses. He was also known as an organizer and sports manager. At one time this building was the site of the Collings’ mattress factory. Ben also cut marsh hay and hauled it down the river on a scow. Sometimes the hay was stacked for winter baling. The horses wore four wooden boots and wouldn’t get off the scow until they were applied. Ben was a furniture maker and an undertaker. His first experience as an undertaker was with the body of his own father. He bought Jack Spence’s fishing business (including nets, reels, pulleys, ropes and the fish shanty at the mouth of the river on the east side opposite the 8th Line). His largest catch of fish was five tons of carp. He fished in the spring and fall and put nets under the ice in winter. Carp was caught (when in season) and had to be kept alive for the Jewish market. He employed about eight men all year round. Later he had old cars cut down to make tractors. Ben and another man broke (worked?) Col. Bar’s marsh land at the north end of Federal Farms Rd. (Bathurst Street). The Newmarket Canal started and died on this property.